Four pygmy goats from Bath College have won a total of five rosettes at a recent agricultural and cheese show. 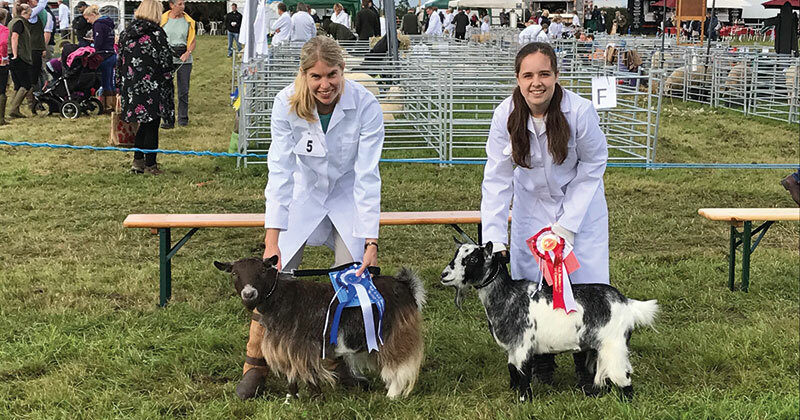 Level two and level three animal care students reared and looked after the goats, who are named Smokey, Bubbles, Twix and Galaxy, for the annual Frome Agricultural & Cheese Show, and won three rosettes for their goat-grooming skills. Three-year-olds Smokey and Bubbles took first and fourth place in their age categories, and Smokey also came fourth in the overall pedigree female category. Animal care staff members Katie Parfitt (pictured left) and Gemma Hancock (right) supervised the students, and took first and second place in the novice handler competition, taking the rosette haul to five. It was the first time the goats, who live at the college’s Somer Valley campus, had gone on an outing. “They had a lovely day and they met a lot of other goats which they seemed to enjoy because they’re sociable animals,” she added.